Acetone is also referred to as dimethyl ketone and propanone. It is a commonly used solvent in different industrial procedures and it represents the famous "ketone group", which is a major component of solvents. It is a liquid that is flammable and colorless at room temperature. It exists naturally, but can also be synthesized. It mixes well with ethanol, ether and water. Plastic, drugs, fibers and several chemicals are made from acetone. Products like nail polish remover, rubber cement and glues use it as their solvent. Acetone poisoning refers to being poisoned by this solvent, and the severity of this poisoning depends on the exposure's nature and the quantity of acetone involved. Acetone poisoning happens when there is a larger quantity of propanone in the human body than what the liver can easily break down. Acetone is a transparent liquid with an odor like that of nail polish removal solution. On becoming exposed to air, it begins evaporating and is highly flammable. This means that it is not safe to use acetone around an open flame. 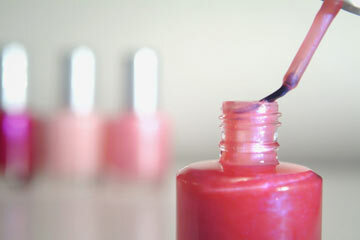 Acetone is a common component of many commonly used products, such as nail polish and furniture polish. However, the occurrence of acetone poisoning is still very low. Your body can handle around two hundred milliliters of acetone easily, as your liver has the ability to break down acetone into chemicals that your body can use. Acetone is synthesized in your body for breaking down fats; hence, you will have a larger level of acetone in your body when eating a low-fat diet. Starvation, metabolic diseases and exposure to this chemical can also cause acetone poisoning (sometimes called nail polish poisoning). If you happen to swallow acetone, you can get help by stomach pumping. If you haven't swallowed it, then an oral breathing treatment procedure is used for clearing it from your blood via the lungs. This is not an all-inclusive list, so you must always read the contents of a product before buying it to ensure that it does not contain poisonous components like acetone. What Are the Symptoms of Acetone Poisoning? There are numerous symptoms of acetone poisoning. These include experiencing a great drop in your blood pressure, nausea, pain in your abdomen, an unusual sweet taste in your mouth, vomiting, a pleasant fruity odor, drowsiness, a sudden coma, acting like a drunkard, lack of coordination, difficulty in breathing, a slower rate of breathing, and the urge to urinate frequently. However, it is imperative to note that very small amounts of acetone are not harmful. The symptoms mentioned above occur when there is a huge amount of propanone in your system. Moreover, breathing a large amount of acetone for a small time period can cause irritation in your throat, nose, eyes and lungs. It can also damage your mouth severely and cause unconsciousness. A prolonged exposure of animals to acetone results in increased damage to the nerves, liver and kidneys. However, it is still unknown whether or not humans will experience the same effects. You should consult a doctor as soon as you notice symptoms of this poisoning. It is best to take the product with you, such as nail posh, that resulted in your acetone poisoning. If someone else is experiencing this condition, then don't make that individual throw up until the doctor advises to do so. What Are the Treatments for Acetone Poisoning? There are different treatments available for people suffering from acetone poisoning. The first thing should be done is to use oxygen. The ratio of propanone in your blood to that in the air sacs in your lungs is 330. It means that about 330 liters of air should be pumped out and swapped with clean, hygienic air to clearing out acetone from approximately one liter of blood. This treatment is effective but has a recovery period of several days, sometimes even weeks. If an individual ingests a huge amount of acetone, do not provoke vomiting as propanone is injurious to the esophagus lining and the flesh in the mouth. A better way is to pump the stomach free from acetone. Doctors or nurses pump the patient's stomach by inserting a tube in the stomach via the throat. Saline or water in small amounts is pumped in the stomach area and then sucked out. This procedure will be practiced until there is no acetone in the body. How Is Acetone Poisoning Prevented? Acetone poisoning can be prevented by following your healthcare provider's guidelines regarding your medication, lifestyle and diet if you are experiencing metabolic conditions such as diabetes. Consult your doctor about any changes in the symptoms so that you can manage the concentration of acetone in your body. You should avoid coming in contact with nail polish removing liquids, paint thinners, and other products that contain acetone: acetone can be splashed into your eyes, enter your skin or stomach, and even enter your system through inhalation. Keep your house properly ventilated when you use products containing acetone. If the ventilation isn't good, wear a mask, safety glasses and gloves. Make sure to keep acetone products out of children's reach and away from flammable items.